Mame is a parrotlet, similar in size to a parakeet, but with a personality more akin to his parrot cousins. For example, while he can fly, he generally prefers to walk. Also, he is more adept at word-like utterances than whistles and has a vocabulary of about ten words, some English some Japanese. He is a part of our daily routines, and a constant source of entertainment. 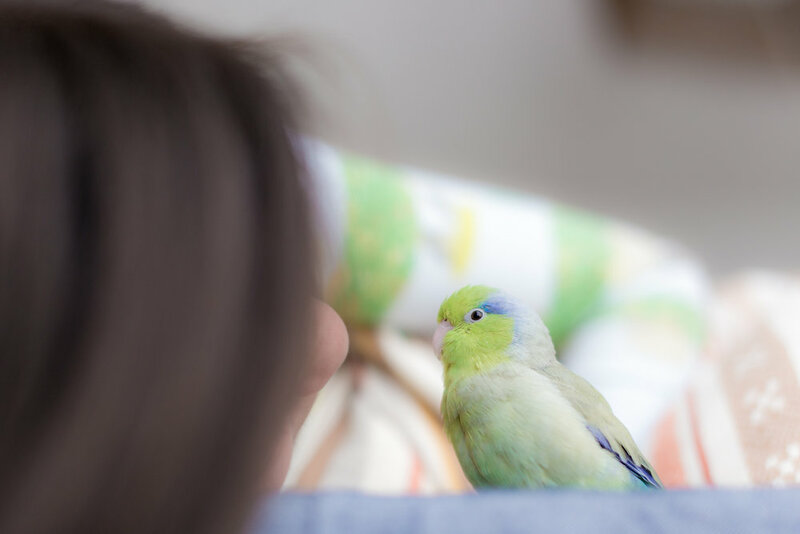 When out of his cage, he is generally either perched on my shoulder as I use the computer, getting his head feathers scratched by my wife on the sofa as she reads the newspaper, or grooming himself on my daughter's lap as she practices the piano. Usually, he stays in the living room, but sometimes, on Sunday mornings, we bring him into the bedroom, where he can enjoy exploring the terrain of the bed. When photographing Mame, I hope to capture more than just his pretty colors. I want to share a bit of his personality, too. But, how do you show the personality of a bird in a still photo? There are not a lot of moving parts on a bird's face. They can open and close their eyes and beaks. They can fluff up or smooth down their feathers. And, that's about it. And, yet, Mame's different moods seem very clear to us. 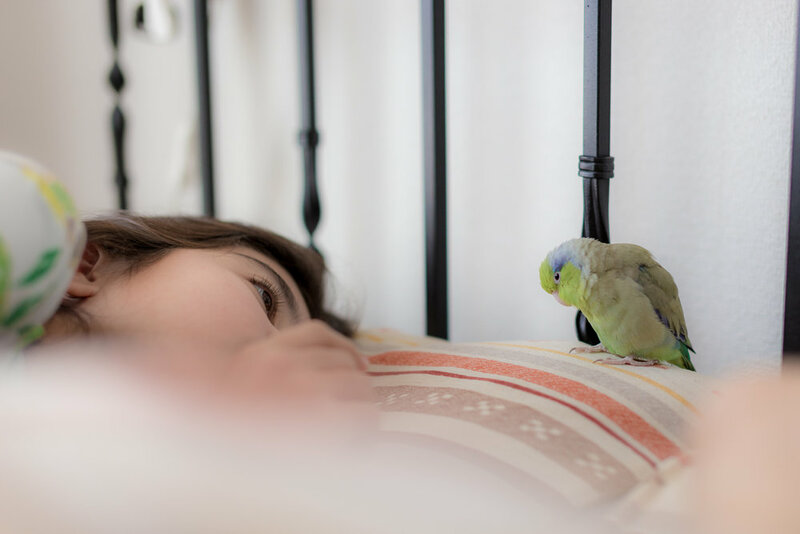 So, on a recent morning as my daughter was playing with Mame in bed, I got out my 50mm to document the scene. Warm, morning light was coming in through the east-facing balcony door, which is one of my favorite lighting situations. I wanted to document the interaction between Mame and my daughter while keeping Mame as the main subject.. I chose low angles to draw the viewer into the scene, and convey a feeling of intimacy. As I would with any portrait session, I tried a variety of angles, some up-close, some further back, and with a shallow depth of field throughout. I also tried to keep a consistent light and tone throughout the session. Hopefully, some glimpses of Mame's personality came through.